Together, computerized writing environments (e.g., physical spaces, hardware, software, and networks) and the humans who use and support such technologies comprise complex ecologies of interaction. As with any ecology, a human-computer techno-ecological system needs to be planned, fostered, designed, sustained, and assessed to create a vibrant culture of support at the individual, programmatic, institutional, and even national and international level. Local and larger infrastructures of composing are critical to digital writing practices and processes. In academia, specifically, all writing is increasingly computer-mediated; all writing is digital. Unfortunately, at far too many institutions, it is difficult to sustain ecologies of digital writing. How then to best plan, foster, design, sustain, and assess the complex ecologies framing the study and practice of digital writing that we do (or hope to do) as teachers, scholars, learners, and writers? The audience for this collection is teachers, scholars, administrators, and graduate students working in fields of composition studies, computers and writing, technical/professional communication, literature, education, and English education. We all face the same dilemma: More and more of our work and instruction takes place in electronic environments, but budget constraints and assessment mandates loom, and often our positions within or institutions prohibit us from active participation in central computing endeavors. This necessarily multivocal collection refines our discussions of the many components of sustainability, providing contextual, situated, and flexible modes and methods for theorizing, building, assessing, and sustaining digital writing ecologies. DeVoss, Dànielle N., Heidi A. McKee, and Richard (Dickie) Selfe, eds. 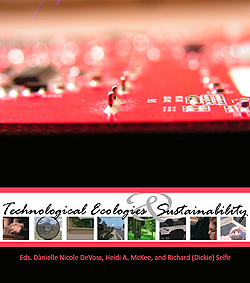 Technological Ecologies and Sustainability. Logan, UT: Computers and Composition Digital P/Utah State UP, 2009. Computers and Composition Digital Press. Web. [Insert date of access here]. . Copyright is held jointly by the Press and the author(s). Ebooks and projects can be displayed or reproduced (with the exception of limited reproduction by indexing and abstracting services) only with prior permission of both parties. Readers may view the projects and download/print a copy of the ebooks found on this site for their personal use or link to this page. Readers may not reproduce this ebook or project or display it on another web site. According to U.S. Copyright law, scholars can use limited samples of the Work for the purpose of analysis, parody, etc. All such reproduction and use should be accompanied by appropriate attribution to both the Author and the Press. Requests for permission to use materials from this ebook or project in other publications will be handled by Utah State University Press on behalf of Computers and Composition Digital Press. For permission to use materials in this ebook or project, please contact Utah State University Press.